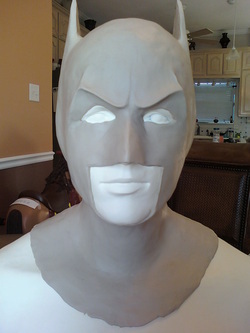 The clay sculpture of the Silicone Batman Mask I was working on. 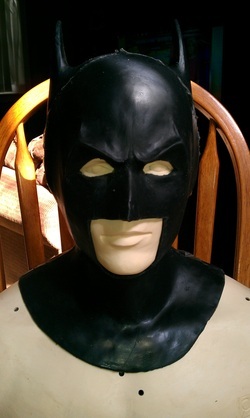 The finished batman mask made out of silicone. If you are not familiar with silicone mask. They are very stretchable and will shape to your face and also move with your face. and when I pulled off the mask, it ripped from the top left corner of mouth about 3 inches up. I was really upset. There was a ton of hours put into this mask, from the sculpt, mold and casting of the mask. I am trying to repair it tonight. Hopefully it will work, or back to the drawing board with a whole new scultp etc.